This is a leisurely, simple horseback ride around an organic fruit and vegetable farm. If you are looking to spend a shorter period of time horseback riding and want to see something other than Maya ruins, come learn about organic farming in Belize. This short guided tour of the farm includes a slow-paced horseback ride through the property with stops to view, discuss, and learn about the natural exotic fruits, vegetables, and medicinal plants that grown in Belize, as well as see some local cattle. 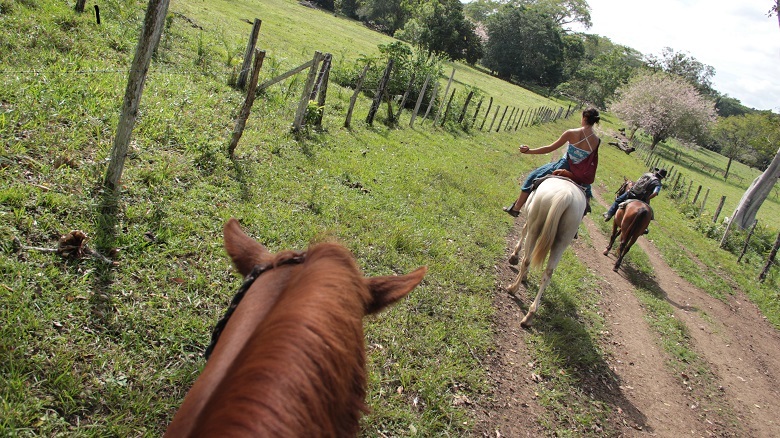 This trip also includes guiding your horse through the picturesque Mopan River and lunch. Difficulty: Easy. No previous horseback riding experience necessary. Riding helmets provided. Weight limit: 250 lbs per person. What to bring: Long pants, sturdy shoes, extra water, bug spray, hat, camera.